The prospects for creation of a global clean electricity grid (GCEG) must address two major elements: first, clean electricity generation, and second, the establishment of a global grid through and across which electricity may be shared. There have been a number of significant studies of the potential for technology transfer to facilitate clean energy generation, including identification of potential patent obstacles. Some of those studies have taken into account the technologies that may be important to creating “smart grids” for energy distribution, including identification of intellectual property issues involving computer software that may be associated with that. This author is not so far aware of research studies specifically concerning technology transfer issues in connection with the creation of a GCEG. That is, what aspects of technology transfer may be relevant to global cross-border trade in “green” electricity, whether there are potential obstacles to such trade created by the global system designed to protect rights in intellectual property, and what might be practical mechanisms for facilitating technology transfer? As to the technologies that may be important for creating an international power grid, and the posited creation of a CGEG, it should be noted that computer software and digital technologies will play an important role, and that patents may not be the only form of IP relevant in this area. While patents are used to protect computer software (with variations among national/regional jurisdictions), software is also and perhaps predominantly protected by copyright, and in certain instances trade secret. Moreover, there are questions arising around “network effects”, for example, and potential widespread adoption of standardized computer networking systems that may be important to a shared grid. Technical standards are likely to play an important role in the integration of systems and networks. The territorial nature of the international intellectual property system raises some intriguing issues in respect to the potential emergence of a global power grid. Though the prospect may seem counterintuitive, it may be that the technologies involved in the establishment of cross-border trade in electricity, and a more extensive global electricity grid, will be more subject to concentration than the underlying energy generation assets. The current global security environment suggests that allowing relatively open access to the technology underlying an energy grid that may address the electricity needs of a substantial number of countries would not be prudent. To the contrary, the potential risks from a security standpoint may argue in favor of a heavily guarded proprietary/secret program to which very few individuals have unrestricted access. One practical solution for creating a system of global technology sharing is some agreement on mechanisms for establishing joint venture partnerships that takes into account the interests of private sector technology suppliers, private or public sector technology recipients, and the interests of the public in affordable access to the resulting energy products/services. A part of that mechanism might involve the creation of a global patent or broader technology pool to which private enterprise and government research laboratories would agree to transfer relevant technologies, and from which grid operators throughout the global system could draw. The foregoing discussion views the potential establishment of a GCEG from a global perspective. Most real-world large-scale projects do not start out as multilateral endeavors, but rather through bilateral public and private arrangements that may be extended geographically over time. Just so, transfers of technology directed toward establishing a GCEG might well begin at a more modest level through bilateral and regional electricity sharing agreements and programs. The WHO Global Strategy and Plan of Action mandated the Director General to support transfer of technology and local production of medicines in developing countries. 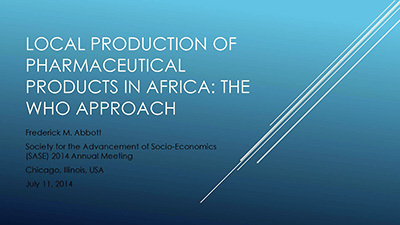 This paper briefly lays out the conditions for local production in Africa and describes the on-going work program of the WHO Department of Public Health, Innovation, Intellectual Property and Trade (PHI) directed at supporting local production efforts. Encouragement of local production is not without controversy as governments must weigh their interest in pursuing the potential holistic benefits of security of supply, support for research and training, manufacturing employment and balance of payments improvements, with assuring that supplies are purchased at prices competitive with global lowest-priced supplies of assured quality. Ultimately, for local production efforts to be successful medicines must be provided at prices competitive with, and of comparable quality to, imported products. The African Union and national governments within Africa are promoting local production, and are working with the support of a number of multilateral organizations including UNIDO, UNCTAD, UNAIDS and WHO, with increasing interest of the African Development Bank. There is considerable attention both from local investors and multinational industry, and there are opportunities for technology leapfrogging. From the WHO perspective, the key element is to focus attention on the promotion of public health objectives, including through the strengthening of regulatory capacity. The author is consultant adviser to WHO PHI.